A couple of months of gluttony, caused mostly by prepping and eating food for the blog, have made me hanker after salad. I’m tragically lazy when it comes to salads. 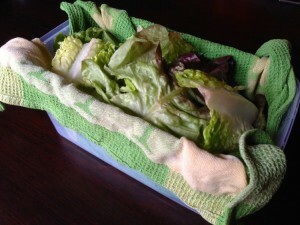 Even though I love them, I often cannot be bothered preparing even a side salad if it involves washing lettuce. Pathetic I know. This hint, from Jamie Oliver, involves breaking up the entire lettuce or lettuces when you first buy or pick them from the garden. You then wash it all in a sink filled with water, spin either in a salad spinner or by wrapping in a tea towel and spinning it round your head madly so the water flies out. Once the leaves are dryish, put them into a container wrapped loosely in a dry tea towel and put on an airtight lid. They stay incredibly crisp and vibrant like this. I have never had any lettuce turn into slime this way. Making a salad becomes as easy as throwing a handful of leaves in the bowl with whatever takes your fancy, dressed with a simple vinaigrette. I usually make in a jar of this and store in the fridge at the same time I prep the lettuce. I find when I do this my salad intake goes up about 500% because I have done the prep before hand in one hit. Taste and season with salt and pepper as needed. Add more oil if it is too sharp and more vinegar if it is not sharp enough. The classic ratio of oil to vinegar in a vinaigrette is 3 to 1. But it can vary depending on the acidity of the vinegar or citrus you use. The important thing is to taste and adjust. You can store the dressing in the jar in which you made it, in the refrigerator. It will keep for a while. When dressing your salad, don't drown it. Less is more.